Modified DD2977 as simple alternative to FMEA (in progress, ready early 2019). Frederick Winslow Taylor told us this in 1911 (Principles of Scientific Management). Henry Ford believed and proved that industry holds the solution to most of society's problems. 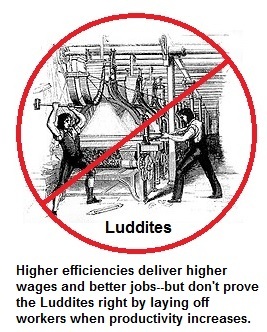 Nothing has happened to change this; manufacturing, and only manufacturing, can create almost limitless wealth. Manufacturing is the foundation of the United States' affluence and national security, and our nation must preserve and expand its manufacturing base. Industrial methods can also reduce the cost of services while improving their quality, and this has critical implications for health care. It is the mission of Levinson Productivity Systems to help clients achieve this vision through lean manufacturing, statistical, and quality assurance methods. "How Henry Ford Saves Men and Money" By Louis Resnick. National Safety News, September 18, 1920. This is in the public domain due to age (1922 or earlier but we have added numerous annotations that underscore valuable safety principles that are directly applicable to ISO 45001. Statistical Process Control for Real-World Applications (2011, CRC Press) This is the first comprehensive treatment of non-normal distributions that often appear in real factories as opposed to the cooperative bell curves that populate most textbooks. Methods for handling them do NOT rely on normal approximations or even transformations. ISO Standards Users: Is ISO 9001 something you "have to do" to make your customers and/or marketing department happy, and just an added expense in terms of registration costs? Do you regard audits as adversarial activities in which you hope the auditor doesn't "catch" you doing something "wrong" for which he or she can issue a nonconformance? Original image: Edward Poynter (1867): Israel in Egypt. Public domain due to age. ISO 9001 provides a framework for a quality management system that prevents the generation of poor quality, and that can even be used to address the other six Toyota production system wastes. These wastes, unlike poor quality, are asymptomatic; they do little or nothing to announce their presence. They are often more costly than poor quality. They can, however, be dealt with (once they have been identified) by the same corrective and preventive action (CAPA) system you must have in place under ISO 9001. ISO 14001, when used properly, can add a lot of profit to your bottom line while reducing costs for your customers and raising your worker's wages. Henry Ford proved this more than 70 years before the standard was developed, and when he could have legally thrown into the nearest river whatever environmental waste wouldn't go up his smokestack. ISO 50001, when used properly, applies Henry Ford's proven principles for reducing energy costs. ISO 9004's clauses on organizational identity, organizational culture, and motivation, empowerment, and engagement of workers, offer an overwhelming competitive advantage to any organization that can implement them. ISO 45001 is synergistic with OSHA's Voluntary Protection Program, and can reduce your experience modification rating (EMR) for worker's compensation premiums along with Days Away Restricted or Transferred (DART)**. Audits are Nonadversarial Activities. ISO standards users should want the auditor to find nonconformances before they make trouble--just as most of us would rather have the dentist find a cavity before it turns into a root canal issue, and the gasteroenterologist find a polyp before it develops into colon cancer. * Does not imply endorsement of this Web site by Tubecon, whose site we found through a Google search on the indicated phrase. The takeaway is that this is how intelligent ISO standards users approach the issue. ** OSHA: "The average VPP worksite has a Days Away Restricted or Transferred (DART) case rate of 52% below the average for its industry." Detractors of ISO standards are quick to point to cases in which an ISO 9001-certified organization has produced poor quality, just as vaccine skeptics are eager to point out everybody who gets sick after getting the vaccine as proof the vaccine "doesn't work." The flu pandemic of 1918, which took place before flu vaccines were available, killed 675,000 Americans (almost six times as many as were lost during the First World War). Flu killed about 80,000 people, out of a population three times as large, in 2018. * Vaccine detractors will be quick to point to the 80,000 who died (including perhaps a handful among those vaccinated) while ignoring the invisible millions who, because of the vaccine, never got sick in the first place. The ISO standards detractors similarly fail to acknowledge the poor quality that never gets produced because of the standard, the poor quality that is produced but does not reach the customer because of the clauses whose specific purpose is to prevent that, and the corrective and preventive action that makes sure the poor quality is never produced again. Standards are most conspicuous when they are absent (or not followed). Lack of standards for the rivets that held the Titanic together--or failure to meet whatever standards existed--played a major role in the loss of the ship and most of its passengers. We should instead be able to take it for granted that the ship doesn't sink, the airplane doesn't crash, and so on, and standards help make this happen. We take it for granted that steam boilers do not explode in the 21st century, and we have ASME standards (which were developed after a series of such disasters in the 19th and early 20th century) to thank for this. We also take it for granted that factory workers are rarely injured by machines in the 21st century, but how many people have ever heard of Robert A. Shaw, Henry Ford's director of occupational health and safety? A Chinese folk tale about three brothers, who were doctors, teaches the same lesson. The youngest cured serious diseases, so he was famous throughout the realm. The middle brother cured diseases in their early stages, so his name never went beyond his village. The eldest prevented the diseases, so nobody ever heard of him. We take it for granted that we do not get smallpox or polio in the 21st century, but how many people have ever heard of Edward Jenner or Jonas Salk? This is how ISO 9001 should work for you. Clause 4.4.1, Quality management system and its processes. It is important to remember that ISO 9001 focuses on a process approach as opposed to isolated standalone activities. Processes have suppliers, inputs, outputs, and customers, and therefore interactions with and handoffs between other processes. These handoffs are frequent sources of trouble, just as handoffs from one shift to another can cause trouble in factories and especially hospitals. Our thought; one of the two processes involved, and probably the supplier, should include specific steps and responsibilities for the handoff. Something that is Everybody's job soon ends up as Nobody's job. Clause 7.2, Competence. How do you ensure that employees and other relevant people (such as contractors and suppliers) are competent for their jobs? Clause 8.4.1 Control of externally provided processes, products, and services. Most organizations control externally provided products through purchasing requirements, but is there a process to cover services and externally provided processes? Clause 9.1.2 Customer satisfaction. Are there processes to assess and monitor customer satisfaction? Remember that many customers do not complain about poor quality, they just take their business elsewhere. Clause 9.2.1 Internal audit. Internal audit findings are inputs to the corrective and preventive action (CAPA) process, and also to management review (9.3.2). Clause 9.3.2 Management review inputs. Do these include audit findings, as well as key performance indicator (KPI) metrics? Minutes of the management review meeting (quality records) should reflect the inputs, and action (outputs of the management review meeting) that was taken on them. Clause 10.2.1 Nonconformity and corrective action. Remember that there is a difference between containment, i.e. protecting the customer from poor quality, and corrective action, which removes the root cause of the nonconformity. General Curtis Lemay phrased this as, "Stop swatting flies and go after the manure pile." The article also cited difficulty with clauses 4.1 and 4.2, context of the organization and needs and expectations of interested parties respectively. These are two of the most important new clauses of ISO 9001:2015, and are inputs to clause 6.1, Actions to address risks and opportunities (which the article also cites as an area of difficulty). Also cited is 5.1.1(d) which relates (again) to the process approach and risk-based thinking. Remember that deficient processes, as opposed to people, are responsible for 80 to 85 percent of all trouble such as poor quality. This carries over into health care where roughly five out of six "malpractice" cases are due not to doctor negligence but rather deficincies in the systems--and ISO 9001:1987 stressed the importance of systems more than 30 years ago--in which the doctors must do their jobs. November 21 2018 New words to support quality and lean manufacturing: "Poka hatto" and "Muda hatto"
Hiyari hatto ("Experience of almost accident situation" or "sudden awareness of unsafe condition"), an employee-initiated near miss report that supports OSHA VPP and ISO 45001:2018 requirements for worker participation. This is not a new word, it has been around for some time in this context, but it can also be applied to quality and lean manufacturing as follows. Poka hatto = "Awareness of error situation" in which a worker realizes he or she could have produced poor quality because the process allows the production of poor quality. Poka yoke, or error proofing, is the obvious remedy. 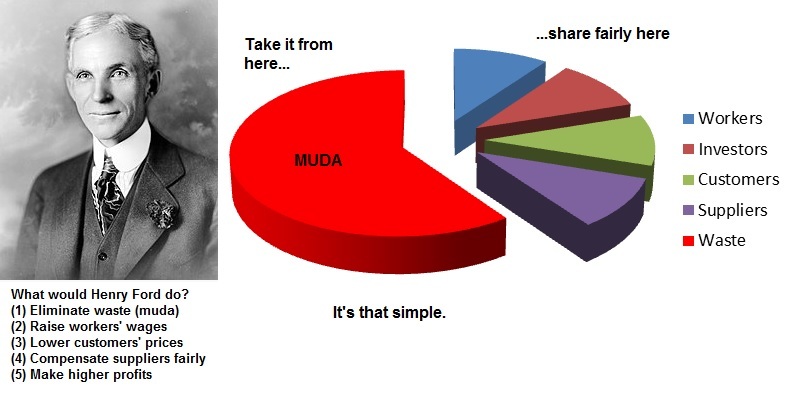 Muda hatto = "Awareness of waste" in which a worker or other stakeholder notices muda or waste that has hidden in plain view for a long time--thousands of years in the case of brick laying. July 20 2018 "Three Apple workers hurt walking into glass walls in first month at $5bn HQ." Unmarked glass doors and walls in workplaces can be dangerous; people can walk into them the same way birds can fly into them. Treat as a hiyari hatto ("experience of almost accident situation") to avoid hazardous workplace conditions. See "Glass manifestations" as required by the UK, but not in most of the United States. March 23 2018 ISO 45001 (successor to OHSAS 18001) became available on March 13. Resource for ISO 45001 Pennsylvania Training for Health and Safety (PATHS) Webinars are available to non-Pennsylvania employers, although free on-site training is not. We recommend (5 stars out of 5) the webinars on near miss reporting and workplace safety committees. Dec. 22 2017 Excellent video by BSI on the transition to ISO 14001:2015. BSI is a highly regarded organization with a lot of valuable knowledge to offer. 3.1 trillion British pounds is a lot of waste (muda) just waiting to be eliminated and turned into higher profits, higher wages, and lower prices simultaneously as done by Henry Ford. We recommend, however, a focus on all material waste as opposed to environmental aspects. Anything that doet not come out of the process as saleable product is waste. Dec. 22 2017 iLearningU video (first of three, the video links to the others) on how to respond to ISO 9001 audit findings. 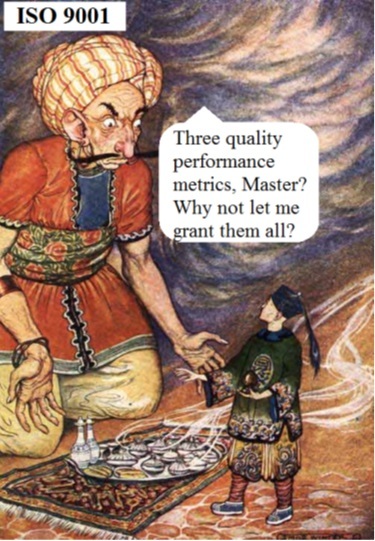 Audits are NOT adversarial activities! Their purpose is to find potential problems with your quality management system (an inanimate object) before they can manifest themselves in ways you and your relevant interested parties will not like, such as scrap and customer returns. If you go to the dentist, for example, you want him or her to find little cavities before they grow up to become big cavities or even problems that will require crowns or root canals. Dec 22 2017 "The Role of Specification Limits." Excellent explanation of rational subgroups. If your control charts don't work, incorrect selection of the rational subgroup might be the issue. Dec 22 2017 "Counterfeit Parts and the 1,000 Risk Priority Number." Our article at Quality Digest. Counterfeit parts can have severity ratings of up to 10 (especially in military, automotive, and aerospace), occurrence ratings of up to 10 because they are introduced deliberately, and detection ratings of up to 10 because malicious efforts are made to conceal them. Dec 22 2017 Process Capability Analysis book by Dr. Neil Polhemus (StatGraphics), review at Quality Digest. February 2, 2010. We have read several articles that suggest that long periods of sedentary work (e.g. at a computer) increase the risk of cardiovascular disease. We therefore offer a free downloadable recurring alarm that the user can set as a reminder to stand, stretch, and/or walk around at user defined intervals. Freeware, no warranties are implied or expressed, but we use it every day. Update March 6 2017. We are now using a variable-height desk that provides the option of standing while working. This has delivered tangible health and productivity benefits. NOTE: due to spam from .info and .asia domains, these are blocked from contacting our address. Please E-mail us from another source such as .gmail, Hotmail, or a personal E-mail account if your business has a .info domain name. Due to the high association of .info with spam, we recommend that you use a .com domain; a Google search on .info and spam will show that others also block this entire domain suffix.